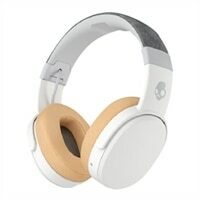 Skullcandy Crusher Headphones with mic full size wireless Bluetooth - gray, tanThe custom-tuned REX40 driver is the keystone of Supreme Sound. The REX40 is designed from the ground up by world-class audio engineering team and delivers an extremely smooth frequency response with minimal distortion - tuned for your playlist. Within the construction of the ear cup, the specially designed acoustical porting allows drivers to move freely, increasing the bass and reducing distortion. No more bulky in-line amplifier. The Crusher draws its power from a premium battery (AA) powered amp hidden in the ear cup. The bass sensation slider on the left ear cup allows you to adjust the sensation levels to your preference or playlist. If you prefer, turn the vibes off completely. You'll still enjoy the REX40 driver's premium acoustics, minus the powered bass boost. No power switch needed. When your music stops or the headphone is unplugged from a source during play, the amp will power off within 10 seconds. Once the music source is restored, the amp will automatically power up and start bumping. The expansive team of engineers used standardized anthropometric data to develop the Crusher's flexibility and clamping pressure. Crusher incorporates dual ear cup articulation and a precise selection of materials to deliver long-lasting comfort without affecting sound quality. Crusher uses carefully selected materials both internally and externally that have been tested rigorously to ensure a long-lasting product. The three-panel cushion padding is wrapped in high quality synthetic leather that sits flat, creating a perfect seal around your ears. Enjoy hours of wear time and a perfect noise-isolating seal. Stash and run. Crusher features a foldable hinge design that breaks down to 40 percent its size. Toss it in the included microfiber travel bag, and your headphone is in safekeeping for wherever you take it next. This single button in-line remote with microphone delivers ultimate clarity and functionality with most devices. Control the conversation and your tunes with the simple touch of a button.